Our RCA 6 Outlet Surge Protector is a quality dorm product that every college-bound student should purchase for their dorm room. With an energy power rating of 450 Joules and a 3 foot long cord, our RCA 6 Outlet Surge Protector is the perfect choice for dorm life. 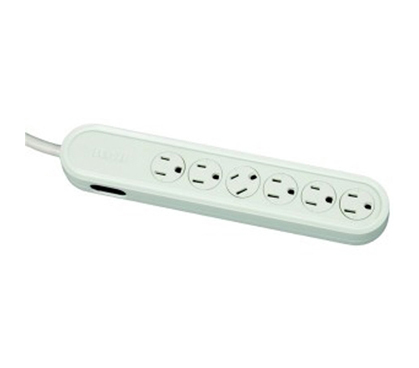 A surge protector serves multiple purposes; not only does it allow you to plug multiple electronics in via the same wall outlet, but it it also protects all of your important technological items from powerful spikes in voltage. Because of this, it is an added bonus that our RCA 6 Outlet Surge Protector even has a $25,000 Connected Equipment Limited Warranty. A handy feature of our RCA 6 Outlet Surge Protector is that unlike most surge protectors, all of the outlets don't face the same way. 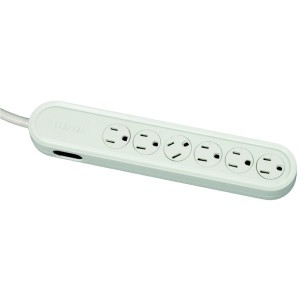 This aspect of our RCA 6 Outlet Surge Protector is just another reason why its a dorm essential that you need to have! Be careful though, some schools are very strict about the kind of surge protector you can use in your dorm room. Make sure you research the guidelines for surge protectors in your residence hall before purchasing one -- it's never good to be left in the dark.